Time to plant those Cucumbers! Of course, cucumbers need lots of sun—full sun, in fact. Vegetable gardens should have 6-8 hours a full sunlight a day. Cucumbers also like warm weather. If you have a limited growing season, start cucumber seedlings indoors early, so you’ll be ready to plant when the warm weather arrives. Wait until soil temperatures have reached 70 degrees Fahrenheit to transplant. Even light frosts will kill these plants. Cucumbers like soil rich in organic matter, well drained, and around a neutral pH (around 6.5). These all really go hand in hand, anyway. Just add some compost to your soil or your planter, and it should take care of the three soil preferences of cucumbers. Cucumber plants are flexible with the pH level. So, they’ll do great as long as the pH level is around 6.5. Cucumbers are hearty plants and easy to grow. Just make sure they have full sunlight and soil is rich in organic matter. Remember, mulch helps soil retain moisture. When vegetables like full sun, soil tends to dry out quickly. Mulch will also keep the cucumbers off the soil away from pests and clean. As with Tomatoes, Peppers and Eggplant...I recommend soaking seeds for up to 24 hours before planting. Cucumbers grow as bushes or vines. Bush varieties grow well in containers. Refer to the variety list above for types of cucumbers suitable for containers and planters. Vine cucumbers will need a trellis, and there’s more space for those in a garden out in the yard. Remember, vine cucumber plants are better trellised. These plants have healthier vines, and harvesting is easier since you can see the fruit. Raised beds are my preferred gardening method and it makes gardening easier! It’s easier to reach the vegetables, control soil health, and control pests and weeds. Some plants actually are bad to the health of cucumber plants. Avoid these plants around cucumbers: tomatoes, sage, and other aromatic herbs. For Organic pest control, use Companion Planting and Diatomaceous Earth. For more info read Using Diatomaceous Earth. For "muching insects," use our recipe for Organic Neem Oil spray. Cucumber plants are easy vegetables to grow. There’s not a whole lot of work to do while you’re waiting to harvest: trellis vine cucumbers and water. Watering is key, and you need to water deep to reach all the roots. Cucumbers absorb and need a lot of water! If you do not do so already, please use an organic fertilizer. Cucumber plants really absorb water, soil nutrients, and fertilizers around them. Chemicals are the last thing you want in your homegrown food. Fertilize cucumber plants about a week after they produce blossoms. You can fertilize about every 3-4 weeks. Make sure you don’t over fertilize. It can lead to misshapen cucumbers. Cucumbers are ready to harvest about 55-70 days after planting. It’s better to pick them early than late. Don’t wait to see how big the cucumbers get! Cucumbers get bitter as they grow bigger, and the seeds can harden, too. Get them before they turn yellow. To harvest, you can cut the vine about 3/8 inches above the cucumber. Or catch them at the right time, and they just pop off the vine. 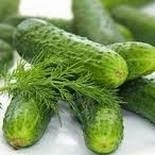 Cucumbers last longer stored in the refrigerator. Keep an eye out for pests, like aphids, pickle worms, mites, and cucumbers beetles chomping on your cucumber plants. Common cucumber diseases are anthracnose, powdery mildew, downy mildew, bacterial wilt, and angular leaf spot. This recipe is SO easy and VERY yummy! Where is the list of bush vs vine cucumbers? Also it would be helpful to have that information in each individual plant listing.